The main arteries of Montreal’s most frequented neighborhoods are packed with some of the best restaurants the city has to offer. Still, in these same neighborhoods some of the finest eateries are often found just off the beaten path. In the case of Kitchenette, a widely inspired restaurant just south of the village, it is tucked away on Rene-Levesque Boulevard, one of the city’s busiest unbeaten paths where only a handful of other restaurants in the area have taken up shop. When you walk into Kitchenette on even the most quiet of nights, there’s a palpable energy in the small restaurant. The décor is simple and muted while the open kitchen allows the kitchen staff lots of space to do their work and be part of the action. Busier evenings prove that they don’t rely on gimmicks to make the restaurant’s atmosphere more engaging. The guests chatter and laughter takes the atmosphere and swells it into something unique every night. Simple white walls with elegant furniture made up of rich leather chairs, marble tables and minimal wall hangings all use very little space in the dining room. It’s an interesting experience that I continue to appreciate more as I keep returning. Kitchenette serves up some delicious food. On my first visit to the restaurant I pulled up to the bar and said hi to the kitchen staff (including owner Nick Hodge and a lovely woman with a warm smile, among others) who were concentrated on preparing food but not too busy to flash a smile. Watching them stack the food onto the plates and then present the dishes to the wait staff to be brought to the clients was mesmerizing. My favorite dish so far is definitely the fried chicken with mashed sweet potato and a delicious bourbon sauce (you have to try it!). The service at Kitchenette has been some of the most impressive I’ve seen in the neighborhood. The waiters and waitresses don’t miss a beat and everyone seems to work well together. With an open kitchen, there’s nowhere for anyone to run and hide, so getting along as a team isn’t just necessary for them but also for the general atmosphere of the restaurant. 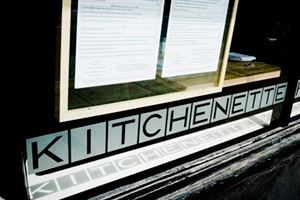 I’m looking forward to heading back to Kitchenette again soon to try something new. This little restaurant has a lot to offer those looking for a quiet romantic dinner or a group of friends who want to get their evening off on the right foot. The trek down past St. Catherine Street is worth it. Simplicity is the key ingredient in Kitchenette’s success.